Loretta Navasie is the daughter of Joy Navasie (Second Frogwoman) and learned her pottery making skills from her mother. 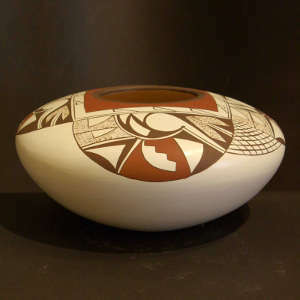 Loretta carries on the family tradition of working with black and red designs on whiteware vessels. Whiteware is the hardest of Hopi potteries to produce but the Navasie family is famous for it.